For those of you that follow this blog regularly I appologize that I haven't written anything for a while. Truth is it's been a little while since I've had much succes to report... I did fish a couple of times recently, but I think the highlight of both trips was the breakfast we had either before or after fishing, lol... So there won't be any hero shots of local freshwater fish to share with you in this addition, ha ha. However, since it is now late July and Marianne and I have a trip planned to Ocean City MD in a couple of weeks... 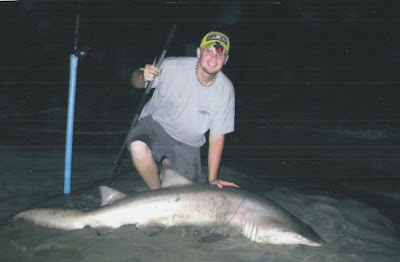 I've been getting fired up about surf fishing, and I would like to share with you a little bit about beach shark fishing and include a few pics from summers past. A lot of people like to shark fish, but most do it from a boat. 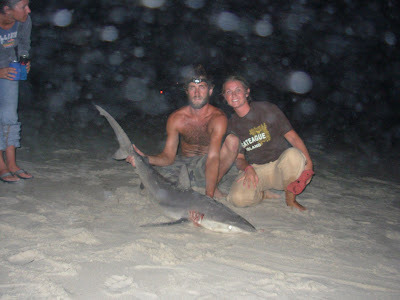 The truth is however, unless you are going offshore for makos or thresers, you really don't need a boat to catch sharks along most of the Atlantic Coast. 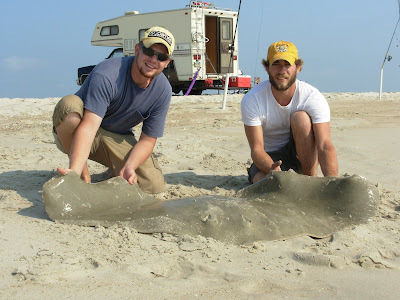 The majority of people don't realize it, but there are some BIG toothy critters out there actively prowling the edges of the surf all summer long. 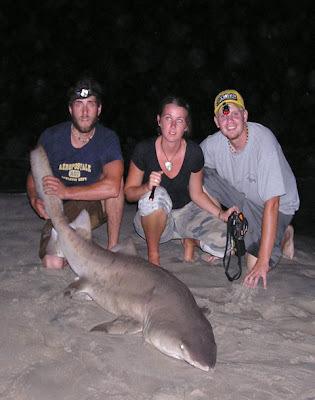 When summer shark fishing from the beach, I generally fish Assateague Island, although the same sharks can be caught off Ocean City and Delaware beaches as well. Delmarva seems to have a pretty good run of sharks that tend to show up around late June and continue on through the end of September--typically peaking around August and early September, which coincides with the year's highest water temperatures. There are five species that make up the majority of the catches in the area. They are: Sandbars (aka Brown sharks), Duskies, Sand Tigers (aka Garbos), Spinner sharks, and Black Tips. Occasionally Atlantic Sharpnose are caught as well as varied other species, bonetheads, small hammerheads, etc... Garbos seem to fight the least out of the bunch, but they also seem to be the largest. While Sandbars, Duskies, Spinners, and Black tips tend to run a bit smaller, they make up for it with their drag screaming runs and blistering speed (especially the black tips and spinners). 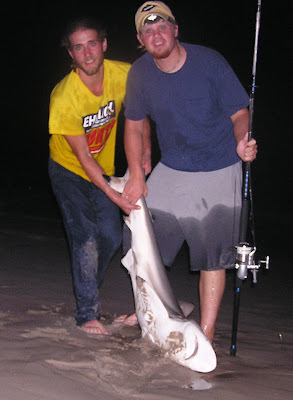 One of my favorite memories of summertime shark fishing was watching the sillouette of a large spinner leap into the midnight sky, summer-sault, and then crash back to the water, highlighted by the bright light of the full moon (and breaking my line in the process, lol). Seriously...summer nights, sand, shorts, and a big chunk of fishmeat on a circlehook--in my book that equals some of the best fishing of the season. Add to it some time spent with good friends, a couple beers, a screaming drag, and a big shark jumping and snapping at the end of my line... it really doesn't get much better--on this earth anyway. Come on August! Come on Ocean City!